In an interview with CNN’s Wolf Blitzer, Mitt Romney says, “Russia, this is, without question, our number one geopolitical foe. They — they fight every cause for the world’s worst actors.” A highlight from the interview is below; please visit http://archives.cnn.com/TRANSCRIPTS/2012.03.26.html for a full transcript. BLITZER: The president of the United States is in South Korea right now, had a meeting with the Russian leader Medvedev, and he was heard with an open mike — it’s always dangerous for these politicians or leaders to be talking near an open mike. He was heard saying this to Medvedev, the Russian president. Listen to this. BARACK OBAMA, PRESIDENT OF THE UNITED STATES: This is my last election. After my election, I have more flexibility. DMITRY MEDVEDEV, RUSSIAN PRESIDENT: I understand you. I transmit this information to Vladimir, and I stand with you. BLITZER: All right, in case you didn’t hear it: “This is my last election. And after my election, I have more flexibility.” That is a factual statement that the president is making. If he doesn’t have to worry getting reelected, he doesn’t have to worry so much about domestic politics. Is there anything wrong in — when in comes to national security issues, to be saying something like that to the Russian leader? 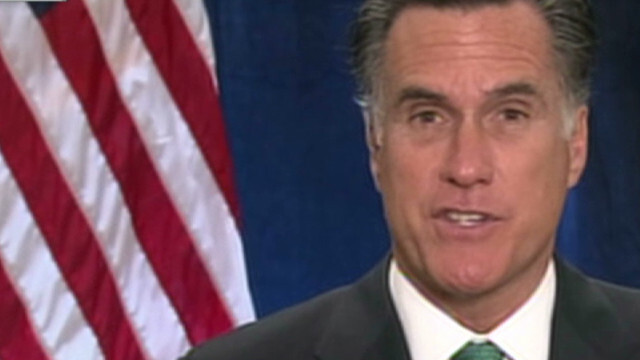 ROMNEY: Yes, there’s something terribly wrong with that. It is alarming. It is troubling. The agreement that the president put in place with regards to nuclear weapons is one which I find very, very troubling already. The decision to withdraw our missile defense sites from Poland put us in greater jeopardy, in my view. The actions he’s taken so far, which he says are to reset relations with Russia have not worked out at all. Russia continues to support Syria. It supports Iran, has — has fought us with the crippling sanctions we wanted to have the world put in place against Iran. Russia is not a friendly character on the world stage. And for this president to be looking for greater flexibility, where he doesn’t have to answer to the American people in his relations with Russia, is very, very troubling, very alarming. I am — I’m very, very concerned. I think the American people are going to feel the same way. This is a president who is telling us one thing and doing something else and is planning on doing something even more frightening. BLITZER: Well, when you say even more frightening, what’s he planning on doing, in your opinion? ROMNEY: Well, my guess is it has to do either with — with nuclear arms discussions or it has to do with missile defense sites. What he did both on nuclear weaponry already in the — in the new START treaty, as well as his decision to withdraw missile defense sites from — from Poland and then reduce our missile defense sites in Alaska from the original plan, I mean these are very unfortunate developments. And if he’s planning on doing more and suggests to Russia that — that he has things he’s willing to do with them, he’s not willing to tell the American people — this is to Russia, this is, without question, our number one geopolitical foe. They — they fight every cause for the world’s worst actors. The I — the idea that he has some more flexibility in mind for Russia is very, very troubling, indeed. BLITZER: But you think Russia is a bigger foe right now than, let’s say, Iran or China or North Korea? Is that — is that what you’re suggesting, Governor? But when these — these terrible actors pursue their course in the world and we go to the United Nations looking for ways to stop them, when — when Assad, for instance, is murdering his own people, we go — we go to the United Nations, and who is it that always stands up for the world’s worst actors? It is always Russia, typically with China alongside. And — and so in terms of a geopolitical foe, a nation that’s on the Security Council, that has the heft of the Security Council and is, of course, a — a massive nuclear power, Russia is the — the geopolitical foe and — and the — and they’re — the idea that our president is — is planning on doing something with them that he’s not willing to tell the American people before the election is something I find very, very alarming.